Before you even get to the pool, take the time to clean up the surrounding area. Sweep up leaves and debris that may have fallen and accumulated on the cover and on the pool deck. Trim any bushes and remove branches from the cover. You also want to clean up around the filter and pump, and trim back grass or plants that have grown around them. Algae can begin to bloom and thrive in your pool once the temperature outside hits 60 degrees, so as soon as warm air starts to move in, test the water. You can remove the winter cover completely, or just lift it in one section to perform a water test. Add some shock to the pool water to prevent algae growth. Remove and clean the cover. Once you have the debris cleared off of the pool cover, you can carefully remove it. Before storing the cover away, it’s a good idea to give it a scrub. Lay it out on the lawn or on a paved surface, and using a scrub brush and hose, clean it thoroughly. Once it has fully dried, you can fold it up and store it away safely for the season. Clean the pool and prep the water. Begin by cleaning debris out of the pool, such as leaves and branches. You will want to have the obvious debris skimmed out before running the vacuum. 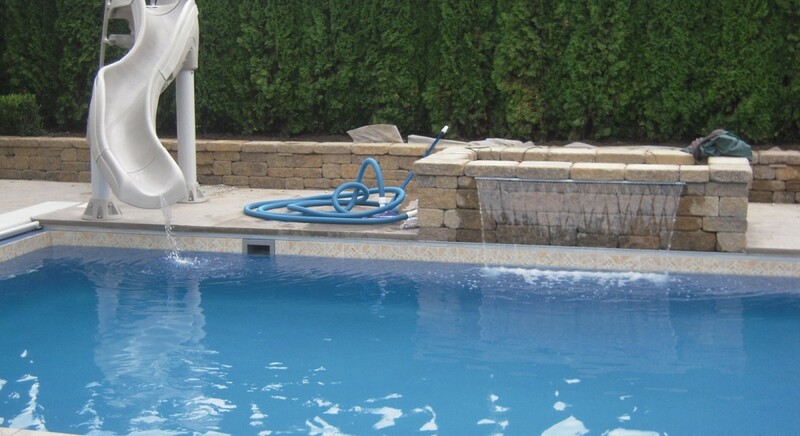 Look over the pool carefully for any stains that you’ll need to remove with a chemical cleaner. Then, prepare the water by using the proper chemicals to clean. This process can take a few days. While the spring may seem too soon to start thinking about the pool season, it will end up saving you time. By getting it ready now, you’ll be able to enjoy the water as soon as the first hot and sunny day shows up in the forecast.